Properties: Very light and flexible, axially compressible (about 5:1) for easy handling and costs saving in stocking and transporting. 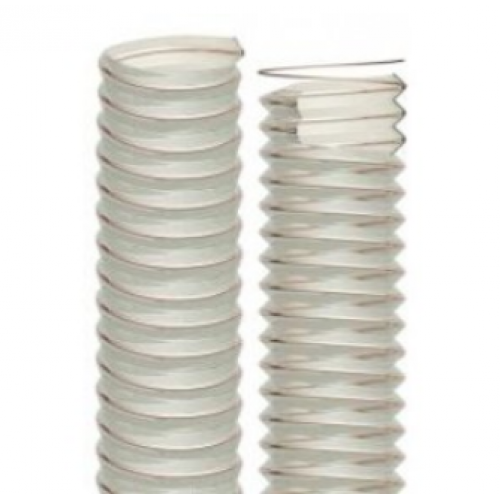 The PU-coated spiral allows a better adhesion and more bending sessions, thus the duct has good mechanical properties and it is especially suitable for dynamic applications. Resistant to abrasion, microbes, ozone and weather conditions*. Halogen free conform to RoHS and phthalates free. Suction of pellets, granulates, abrasive powder, dust. In woodworking and dust extraction industries and everywhere very high flexibility is required.